KORG brings another good powerful offering to the masses. The powerful KORG pa 900 is the older of the three siblings, the KORG pa 300, 600 and 900. All the three keyboards in the line-up are extremely powerful instruments with a lot of capabilities. Here we will review about KORG pa 900. Last time around when I wrote about KORG pa 300, I wrote a lot of introductory material about KORG the brand and the Keyboard. So here I don't think I need to do the same here. I would just give a brief intro about the instrument itself. This offering from KORG is extremely powerful as I quoted earlier. There are a lot of cool functions, unbelievable sound quality, and sturdy build quality. Whichever company is producing a premium product will always claim it to be the best in the world. A premium product is brought into the market after a long research session in the R&D department for actually bringing the best they can as a team of professionals working to increase their standard with every product launch. Big tall claims are made by companies stating that their product is the best in the world. This is done by companies because of the unimaginable competition in the electronics world. We as the consumer shouldn't be worried about what kind of promises and claims the company is making we need to concentrate on the product. Here that is what I am trying to do. I am not going to debate which is the best Yamaha or KORG, but I would tell you my opinion. When it comes to design Yamaha will always be on top, no matter what kind of new designs companies are going to bring Yamaha is always the best in design. But when it comes to voice clarity and sound I would always prefer KORG. I don't know what the reason behind it is, the DNA behind the sound engine of Yamaha is different and due to which it has a different flavour, on the other hand the DNA behind KORG models is different and hence has a different feel to it altogether. Anyway I would say my personal favourite in terms of sound quality will always remain KORG. It is my personal choice. It doesn't mean that Yamaha is not good with reproducing realistic sounds but my personal favourite is KORG. All the three Keys in the series are extremely good and there is no considerable difference between the three. But as a premium Keyboard the Keys has a lot of features which you don't find in the 300 and 600 variants. The basic design concept of all the three keyboards in the line-up is the same. If you happen to come across the 600, then you can easily understand that it is related to 900 or 300 just because of the design. Where the things change is the screen, buttons, and the complexity. As the keyboard level increases, means the bigger the keyboard the bigger the screen. Pa300 has a 5 inch screen whereas the premium 900 has a 7-inch one. Let's begin with the Design and the build quality. Design and build quality is the way it should be. Design is good and looks a bit premium but not as modern and polished like the Yamaha's. One of the things I don't love about the KORG designs is the buttons and switches which look dated. The square buttons you would find on the KORG is not the kind of design you would want to see on a premium Keyboard. There may be people who would like it, but I don't like this design attempt from KORG at all. This is the only thing I don't love about KORG. I don't know when they are going to change a little from the traditional designing pattern and really bring something which can justify the company. The black colour scheme which is new in the KORG's designing pattern is better than the boring and really out-dated not so impressive blue colour of the Pa series which was even more disgusting. The Build Quality is superb and you will have that premium feel while you use it as one of your keyboards in recording or practice sessions or for the performances. So the design is a mixed bag, some may like, some may not. As far as I am concerned I am not a big fan of KORG designs. Yet the build quality is good and reliable. 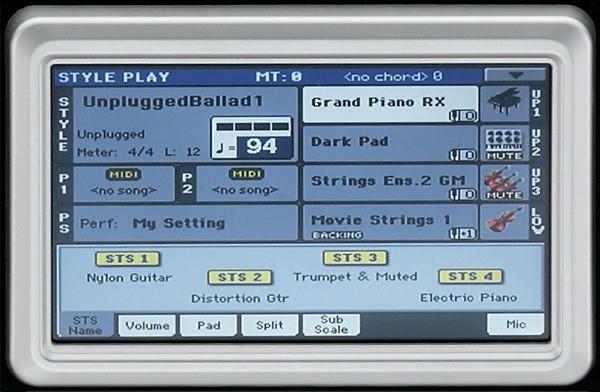 The User Interface is a very bold move from KORG for the way it is designed and also for the bigger, clearer and crispier 7 inch TFT screen with the KORG's trademark TouchView™. This is a great utility for accessing the files and other musical resources straight from the screen and not by wasting time by navigating through buttons and switches. The User Interface in itself is user friendly and helps in understanding the overall functions and other things related to the overall working of the instrument. It is not that simple to understand but easy for professionals and people who have used a KORG keyboard before. It is simple and intuitive and the touch screen helps in really bringing out the best in from the User Interface and understanding the instrument a lot better. It is definitely one of the best orchestrated User Interface. KORG always scores big in this department. I would give 4.8 stars out of 5 for this fantastic User Interface. 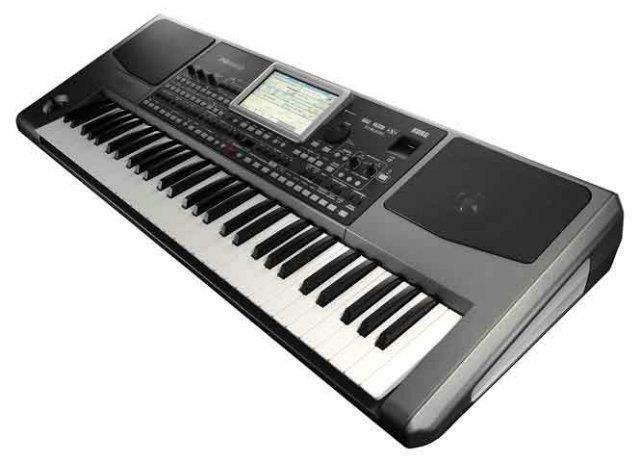 I have discussed about the special features of KORG Pa300 and as both the keyboards are almost similar in some aspects I don't believe there is any need to really elaborate all the special features. Here I would love to highlight only those features which are exclusive for KORG Pa900 alone. 61 semi-weighted keys with Velocity and After Touch. High-Quality two- way integrated amplification, and high quality output (DAC) audio converters. DNC (Dynamic Nuance Control) more realistic and vivid. Four Stereo Master FX, superb guitar effects created using KORG's REMS™ (Resonant structure and Electronic circuit Modelling System. Mastering Limiter and final 4- band Parametric EQ. "Chord sequencer" function to record on-the-fly any chord progression. XDS Double Player with X- Fader. Plays standard MIDI Files and MP3 files. MP3 recorder. MP3 Player with Vocal Remover. These are some Unique Features. All these functions really gel-up together to give the user the best experience of encountering with the best Sound and music experience. The Sound Engine in the KORG Pa900 is one of the best. I have been saying this for a long time. One of the most natural, crispier, realistic sounds ever reproduced. The voices, songs, styles and all the musical resources you will find on this KORG machine are super cool and realistic at the same time. The 61 semi-weighted keys gives much more real and original feel while playing. The voices are so natural that you can almost make all kinds of music using this single keyboard. Whatever I may be trying to say about its performance may seem a bit exaggerated but it is true. It performs even more brilliantly than what the spec sheet speaks of. The easy to use user interface, superb sound engine, sturdy light weight cabinet design, everything blends so seamlessly to give you the best musical experience. Pros:Superb, light weight cabinet design, Amazing sound engine, Larger, 7-inch TFT Touch screen, easy to use User Interface, one of the best realistic voices and styles ever created, wonderful FX. Any one will love this superb and fantastic keyboard with realistic sound engine and great build quality. There is nothing that will disappoint you on this fantastic instrument from KORG. Sound is great and you will get your money's worth. I think the only thing that disappoints me is the design of the buttons, switches and knobs. The ugly basil built around the screen is also not so impressive. Other than that everything on this is really superb. A great instrument for programming and arranging and creating all types of music with more dynamics and FX, and you can do that with ease and in a very joyful manner. This is one of those Keys you would always want in your studio. Hope this article is useful. Keep Playing. Keep enjoying. God Bless.